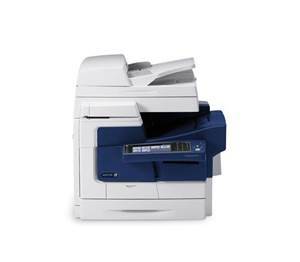 The multifunction Xerox ColorQube 8700 is ideal for offices with high-volume printing needs. Aside from printing, this unit can also be used for emailing, copying and scanning. The main trouble with the Xerox 8700 solid ink printer is it uses solid ink, therefore it needs to be left running or it takes a while for the ink to melt. The compact ColorQube 8700 printer comes with a flatbed scanner with an automatic document feeder. The control panel features a 7 inch touch screen display. The Xerox ColorQube 8700 has a standard paper handling capacity of 625 sheets but it can be expanded to 3,475 sheets.